RP takes issue with TOC's report, TOC responds to RP's allegations. Below is Mr Kenneth Jeyaretnam’s letter to The Online Citizen in response to our earlier report, “Milder and more credible”, written by our News Editor, Terence Lee. Following Mr Jeyaretnam’s letter are the responses from Terence and TOC Chief Editor, Andrew Loh. I would like to add my point of view to the furore that has been created by Terence Lee’s remarks in the opening paragraphs of his otherwise excellent article on the Youth Wing of the Workers Party. I would thank Seelan Palay for his loyalty to the opposition cause and feel that this issue is grave enough for me to also come to the defence not only of my late father but of the concept of opposition and even of Democracy. Like Seelan I am gravely concerned that a write up of the Workers Party Youth Wing was used as an opportunity to attack JBJ and I believe, by association, the RP as the Young reformers write up showed them sitting in front of a portrait of JBJ. TOC has promised to introduce us to each party’s youth wing in turn and as each party will be given a fair bite of the apple it really is unseemly to use the space to attack other parties and individuals. In addition JBJ is no longer with us, is unable to defend himself and the dead are unable to sue for libel, so this ’out of the blue’ and completely graceless attack on the man who was not only the founder of The RP but also the WP’s own former SG and their current SG’s mentor was particularly cowardly. I must admit to being confused throughout the article as to whether this definition of The WP as “what they are not”, is a device of the TOC writer Terence Lee or is a result of impressions he formed during the interview. As the interview was conducted by email I feel it not unwise to assume that the paragraph, “Don’t expect rabble-rousing politics from the Worker’s Party of today. 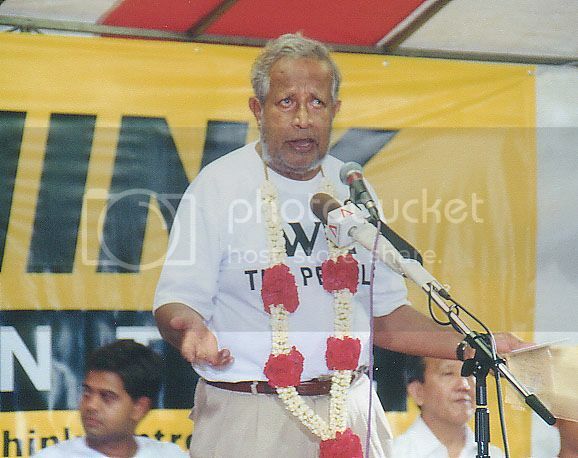 Unlike the late JB Jeyaretnam, who was nicknamed ‘The Tiger’ for his unrestrained election rally speeches and rambunctious attacks on the PAP….” comes from Terrence himself. When Terence uses the word ‘rambunctious’ he may simply have been looking for a colourful or impressive long word or he could have deliberately chosen the word most in line with PAP policy and most likely to discredit JBJ. Rambunctious is defined in the dictionary as ‘unruly’, ‘rowdy’ or ‘out of control’. Terence is simply continuing a 30 + year tradition of portraying JBJ as a mindless vandal intent on destroying Singapore. This tradition has seen its latest embodiment in our Prime Minister’s disingenuous explanation of the need for a cooling off period as being to prevent the risk of public disorder. In one paragraph Terence has reduced JBJ to being a mere hooligan and those patriots truly interested in improving their country to being an out of control crowd. I said earlier that this is a cowardly attack but it is neither unusual nor unexpected. At the time of JBJ’s death it became apparent that there would be a concerted effort by those in power in Singapore to continue with this 30 year long character assassination and that, even more insidiously, steps would be taken to downplay JBJ’s role in Singapore’s history, if not to erase it altogether. This started with the unpleasant obituary in the Straits Times where, amongst other smears, JBJ was described as engaging in confrontational Westminster style democracy. Shortly afterwards I was involved in an attempt to start a foundation to procure a scholarship fund in JBJ’s name. However I was told that it would be a non starter as JBJ had a criminal record. Hmmm- tell that to all the recipients of the Mandela awards and foundations. In any case let’s not forget that he was completely and absolutely exonerated by The Privy council in 1988. I found ‘confrontational Westminster style’ to be a strange description of Parliament in London which is hardly a place where punches are thrown, unlike in some Asian democracies. One of the salient features of British Parliamentarians is that whilst they may robustly challenge their colleagues in the house, later in the evening members of opposing parties can be found swapping stories in the Commons bar. I am not holding up Britain here as a shining example of government. I am simply pointing out a PAP policy of attempting to discredit Democracy as a system of government by linking it on the one hand with riotous behaviour and on the other as a purely Western concept. And for the record do I need to say that Democracy is NOT a purely Western phenomenon totally unsuited to Asian styles of thinking. Most Asian countries are currently prospering under Democracy. There are many criticisms that can be thrown at JBJ but unruly is not one of them. So he was a fiery orator and he was able to turn a mere crowd into a cheering rally but he was never an advocate of civil disobedience. In fact to the contrary, the only rebellion he believed in was a democratic one at the ballot box. He was honest, courageous and completely selfless. JBJ’s legacy to Singapore is of the utmost importance and we all of us, not least the Workers Party, owe him a great debt of gratitude. I urge you all to be vigilant to the continued attempts to rewrite history and to attempts to persuade you that wanting to have a say in how your country is run is somehow un-Asian, dishonourable or even downright criminal. If we are going to patronise the New Media then I would ask the New Media to return the favour by bringing us new and alternative styles of writing and not by trotting out the hackneyed Big Brother speak that we can read in the government-controlled MSM. I would only add that some of the remarks posted in the comments following these two articles degenerated into party bashing and as I had lunch with MP Mr. Low Thia Kiang only yesterday I can assure you that relations between the RP and the WP are friendly. I will be celebrating JBJ’s legacy on his birthday January 5th, 2010 and welcome you all, of whatever persuasion, to join me and ensure that his legacy is not forgotten. In both letters, the insinuation is made that my article has somehow disparaged the reputation of JB Jeyaretnam, with his son going so far as to call my article “graceless”, “cowardly” and “out-of-the-blue” — an assortment of colourful terms which I find regretful and unfortunate. I wonder if they know what they are talking about. FEER: So they’re more like the docile opposition parliament members who are often praised by the PAP? JBJ: That’s right, yes, you’ve said it. That’s why Lee has said that they would accept Low Thia Khiang and Chiam See Tong. And I think he said once or twice that it’s because they’re not against the system, whereas Jeyaretnam is, and Jeyaretnam has to be destroyed. So after I came out of bankruptcy I decided to form a new party. Our statement is that it is because of the present system that we got this great inequality between the rich and the poor. Our citizens are denied of their fundamental rights? FEER: What is your opinion of the campaign of civil disobedience that Chee Soon Juan has been waging against the govt? JBJ: Certainly civil disobedience has a place, and as I told the foreign correspondents at the lunch on the 31st of July, I suppose there might have to come a time that if the government is not prepared to listen to our peaceful protests, there must come a time where we have to resort to civil disobedience. I myself am not against it, but I didn’t think the time has yet come for that. Before you can effectively launch a disobedience campaign, you’ve got to educate the people; you’ve got to get them ready to participate in it. That is just not possible today in Singapore, because of the fear that girds Singaporeans. They say yes alright if we come and participate in this civil disobedience, what’s going to happen to us? Aren’t we going to be arrested and carted off into courts, and then put into prison? It becomes quite clear from the interview excerpt that JB Jeyaretnam himself was a fierce critic of the Worker’s Party’s current style of politics, and it is disturbing that his son has no knowledge of his support for conditional civil disobedience. Mr Jeyaretnam, playing the English teacher, finds dissatisfactory my use of the words “rabble-rousing” and “rambunctious” as they seem to portray his father as a trouble-maker. However, a check with the Cambridge’s Advance Learner’s Dictionary reveals that these words do not necessarily connote a negative meaning. A rabble-rouser, for instance, can be defined as “a person who makes speeches that make people excited or angry, especially in a way that causes them to act as the person wants them to.” This aptly describes the political career of JB Jeyaretnam. I also do not think that my use of the word “rambunctious” discredits in any way his style of politics. While the word can mean “unruly” and “out of control” as rightly pointed out by Mr Jeyaretnam, it can also mean “full of energy and difficult to control”, which is an entirely different shade of meaning altogether. I’m not sure which dictionary Mr Jeyaretnam or Mr Seelan is using, but it sure differs from mine. That aside, it is more helpful to focus on the spirit of the article’s introduction rather than be bogged down by its details. In that respect, it is quite clear that I strove to compare the Worker’s Party which was led by JB Jeyaretnam with that helmed by Low Thia Khiang. There was never any intention to propagate the ruling party’s point of view, unlike what Mr Jeyaretnam or Mr Palay would like to allege. Lastly, I would like to address Mr Seelan’s grouse with my statement about how the Worker’s Party is conscious about avoiding the defamation suits faced by JB Jeyaretnam. What I intended the statement to mean was that the Party would most certainly want to avoid the defamation suits faced by JB Jeyaretnam simply because it has a cautious approach to politics, nothing more. No insinuation has been made anywhere in the article, whether explicitly or implicitly, about who is to blame for the lawsuits he faced. I suspect that the conciseness of my introductory paragraphs might have caused Mr Seelan to tack on additional meanings onto the article that was never there in the first place. From the looks of it, it seems that both Mr Jeyaretnam and Mr Seelan are somewhat averse to the honest portrayal of JB Jeyaretnam as a fiery politician who ruffled quite a lot of feathers in Parliament. While descriptions like “rabble-rousing” and “rambunctious” — which suggest disorder and rebellion — are shunned by these two individuals, words like “fiery” and “courageous” seem safer and thus more acceptable. Which really makes me wonder: Who is really the one trying to repaint the portrait of JB Jeyaretnem? It is regrettable that Mr Jeyaretnam would insinuate in his letter that The Online Citizen is somehow involved in or is a part of any alleged “concerted effort by those in power in Singapore to continue with this 30 year long character assassination” of Mr JB Jeyaretnam. TOC has been supportive of Mr JBJ’s efforts and works and has the utmost respect for these and Mr JBJ himself. A search on the TOC website reveals the many reports and articles which we have published which were supportive of these. With regards to Mr Jeyaretnam’s comment that our “write up of the Workers Party Youth Wing was used as an opportunity to attack JBJ and I believe, by association, the RP…”, Mr Jeyaretnam is completely off the mark here. I find this a rather flimsy and tenuous reason for making such a serious allegation against TOC and it is indeed regrettable, especially when it is coming from the Secretary General of the Reform Party. The Online Citizen stands by Terence’s report and rejects completely the allegations made by Mr Jeyaretnam.